“Dancing in the Street” by Martha and the Vandella’s was an anthem of the youth movements in the emergent New Left. Martha called the children of the world out onto the street in celebration and protest. 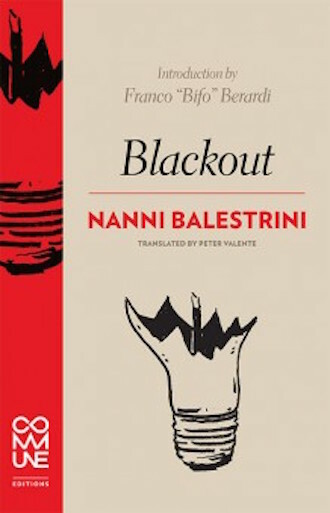 Blackout by Nanni Balestrini imagines a power outage in a city like New York as an opportunity for significant social change. Nanni Balestrini was a revolutionary poet and activist in 1960s Italy. He was a founding member of the Gruppo 63, which eventually came to be called Neovanguardia, a group of artists and activists that spearheaded the carnival and parodying spirit of 1968 in Italy. Through a rare alignment of progressive history, this party joined with other workers movements to form a governing coalition, before being chased out by reaction. Balestrini wrote poetry using cutup newspapers and found objects. He experiments in the modern tradition of combinatory poetics and the poetry of headlines, or the feiulleton. At the turn of the 20th century, newspapers began including feiulleton or fait divers. These were brief accounts of happenings. Their breathlessness captured the spirit of acceleration and mass media. Many modernist luminaries spent years contributing these kinds of accounts including Robert Walser, Felix Feneon, Milena Jesenka, and Roberto Arlt. Balestrini used this method as a way of commenting on the strangeness and excitement of the events of the day, even as he influenced the course of these events. In 1969, the Italian student worker’s movement effectively partnered with labor organizations, in a moment called “Hot Autumn.” This led to the establishing of a coalition government between several leftist factions Potere Operaio and Lotta Continua officially bringing in an era of operaismo and later autonomia government. Ideologies founded in an emphasis on governance through worker’s councils. Blackout is interspersed with the comedy and the cynicism of ten years’ worth of political experience and frustration. Balestrini’s experience with politics represents the frustration of modernism, and the New Left in the face of something never quite arriving, and in the face of the emergent new order. And as an activist poet of a named avant-garde, and an actor within a social protest movement, Balestrini was inevitably pulled into the histiography of the New Left. While his voice persisted through Italy’s Hot Autumn of 1969 and the subsequent stratification of worker’s under reactionary government, he is not primarily a poet of disillusionment. It’s important to remember that in 1968, change was inevitable. In Italy this change came and persisted for a decade without ever reaching the promise of a coherent socialism. Balestrini writes about the frustration of this promise deferred, but he also captures laughter and kindness, suggesting that greater freedom emerges when people work in concert against global violence. So while his trajectory mirrors many other luminaries of the New Left, like Godard for example, he captures a moment defined by many competing ideas. But it also demonstrates the multiple voices within a single movement or party. Balestrini pulls quotes from agitators discussing their tactics and goals. He draws on texts pulled from the mass media: newspaper clippings, radio reports, and advertisements. He cuts all of these up and reframes them in an ongoing pastiche. This conversation reflects some of the productive exchange happening every day in contemporary societies straining against bonds. His practice becomes a mode of expanding social vocabularies. There is the mundane and banal language of governance, as the romance of protest is outlasted by another romance. Tension is never reconciled. There is no one way of making the good society. Balestrini captures the solipsism and euphoria of experience alongside the frustration of a movement grounded in multiplicity. Much of the collection is steeped in the language of direct democracy. For Balestrini, social organizations are mutable. He identifies the challenges and joys of working with the levers of collectivism; realizing that the possibility of people having sovereignty over the organizations that influence their day to day lives is transitory. And that our social ties trend too often towards consolidation. The narrowing of language that he challenged persists today, with many of the trends he resisted having only become more pronounced. So the collection is timely without feeling too romantic. It’s part of an ongoing project.